Maternity clothes? I’m wearing stretch pants. And I love it. Stretch marks? This has been a sad week. I now have one gigantic stretchie above my belly button. My body as far as I’m concerned is now a total loss. Sleep: Past couple of nights have been okay – falling asleep quickly and sleeping more on my back. Best moment this week: Knowing we are totally set for this kid. Movement: Yep. Got a huge kick while trying to pee earlier. Thought it was my water breaking. The kid’s already a prankster. Food cravings: Back to craving avocado rolls & white wine. Gender: Now that the girl name is settled, I’m totally convinced it’s a girl. Labor Signs: None. My back hurts, but I think it’s because my body is disagreeing with all the laying I’m doing. Belly Button in or out? Ugh. What I miss: Being comfortable. What I am looking forward to: Getting this baby out!!! Weekly Wisdom: Candy corn is good. Milestones: We are officially full term. GET THE HINT, NINJA! Two things happened last night that I can barely explain, but make me so happy. 2.) I slept on my back more than any other position last night. AND IT WAS COMFORTABLE. Where did this come from? My back is a little sore today, but what the hell? I’m hoping they both continue. Maybe my body has just given up fighting this pregnancy and is just allowing anything to happen. FINE. I’LL TAKE IT. Also – we shook on a girl’s name last night, which means the naming drama is now OVER. We have a boy’s and girl’s name. And you’re all still going to have to wait until the baby’s here to find out what it is. Car seat was installed on Saturday (and was WAY easier than I thought it would be), and the remainder of the baby clothes have been washed. I’m making one final trip to Babies R Us today for misc. last minute things I probably don’t need…but want anyway before the baby is here. Do you hear that, Ninja? We’re FINALLY ready. Ready when you are. So…my parents will be here this weekend – Friday sounds like a good day to make an appearance – no? WORK ON IT. One, the car seat DID come yesterday! Now, to try to figure out how to install the damn thing. The instructions are VERY intimidating. I’ve heard YouTube has a plethora of vids on how to install. I’ll be checking those later. But I lerve it and I’m so glad I went ahead and had it shipped to me instead of just picking a different pattern. And second – one of my friends from back in the day/my hometown had her baby last night (on her due date, no less)! She too was on the “wait and see” plan for the gender, and she had a boy! (Just like everyone predicted at my shower back in June.) For the record, a girl was predicted for me by the same ladies. We’ll see if I’m friends with psychics soon enough. *NOTE TO LABOR GODS – I’M TOTALLY JOKING. No need to show me what’s really up for a week at least. Mucus Plug – Still gone. Bedrest – Still till the end, unless I want to be in pelvis splitting pain. Measuring – Around 35 weeks – only because I’ve dropped. Baby is at 0 station, which is lower than last week’s -3. 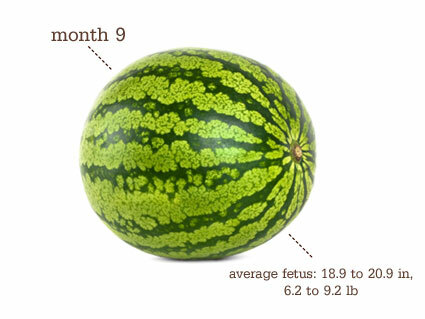 Essentially, between the baby being so low, my dilation and effacement – I’m halfway done with labor. The only pain I’ve experienced is my gallbladder (now known as Vincent) and the cervix clawing. (Some of my ladies think the ninja is just hanging on for dear life – I concur!) I’ve had a few contractions with some cramping in the last week – but nothing to write home about. So, HOLY CRAP. It’s so close now I can nearly taste it. Now if the UPS man would just get here with our car seat…we’ll be ready to rock and roll. The hubs and I went out for lunch after my appointment today and then to Best Buy, a rug store and Target. We FINALLY got a rug for the baby’s room, and also found a new one for the living room…which of course required us to buy new throw pillows at Target for the couches to tie it all together. (And I had to pick up some long sleeve onesies for the ninja to wear underneath all the short sleeve ones I ended up with. It IS fall. At any rate, after having a hand shoved up my babymaker and all the walking/standing today…I’m beat. Especially since I only had about 3 hours of sleep last night, thanks to cervix punches and Vincent the gallbladder being a douche. The hubs is having a night out (well deserved) with his phone well within reach. I’m a little ascurred of something happening tonight considering the events of the day, but hopefully the ninja will at least make it through the weekend. My parents are planning on being here next weekend…or sooner if need be.